The musical work of Dean De Benedictis is one of continued engagement. With clear phrasing, pacing and feeling his realizations are infused with both thought and spirit. Salvaging the Past (75'06") is less a collection of songs and more a reflection of all things telluric. De Benedictis fills each of the ten tracks with a distinctly different ambiance. Densely layered scenes give way to more expansive compositions. Spacious washes of sound create a harmonic backdrop suggesting barren desert and wide-open possibilities. This album provides many access points by including familiar sounds like cello, voice, flute, acoustic guitar and percussion and avoids the abrasiveness of overt aural experimentation. 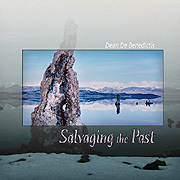 But De Benedictis is foremost an electronic musician and bases the music on Salvaging the Past around a captivating mix of synthesized harmonies, echoing keyboard melodies and multiple lines of entangled sequencer tone patterns. The album's arrangement is tight and expresses a relentlessly solemn inner monologue. With delicate interludes on one track and dizzying repeated riffs the next, Salvaging the Past is a tapestry of insistent rhythms and shimmering timbres. This album possesses a higher complexity than basic ambient, greater emotional integrity than new age and a softer approachability than space music.